This is a great time to point out that certain boxes for Hero Vehicles look like a great half-gallon box of ice-cream from Thrifty’s. YUM! 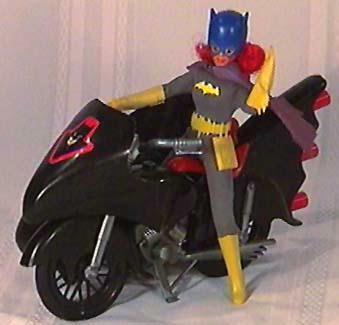 The Batcycle came in blue and black versions. Most people prefer the black, but I think you need both to be happy, so sell me your black one! It’s on my want list. The blue one above is from my collection and demonstrates the chummy sidecar for the Boy-Wonder. The sidecar is removable, and the post that attaches the two units is prone to breakage. The cycle itself does have a kickstand that allows it to stand on it’s own. This black Batcycle is courtesy Steve Caballero. You can see the kickstand along the engine block. The kickstand doesn’t move, it’s just there to promote the bike standing upright without the sidecar. It’s nice to ditch the sidecar on occasion for solo excursions or adventures with the Damsel of Darkness. Note that the sticker on the sidecar is the winged image also on the Batmobile, but the cycle itself sports a very cool batman head image.